Raphael (Filo) Gutierrez began working as a spur and bit maker at the age of 16 and worked for G.S. Garcia’s company at first, where he met Bill Phillips. The two worked in Garcia’s shop together for four years before they decided to move to Cheyenne, Wyoming and start a business together. They started the business in 1916 and listed gunsmithing and locksmithing among their services in addition to bit and spur making. In 1918, Phillips was drafted into the war and upon his return in 1919 the two dissolved the business with Filo moving to San Francisco where he had a great career on his own while Bill Phillips stayed in Cheyenne and continued making bits and spurs in addition to doing other jobs that came along. 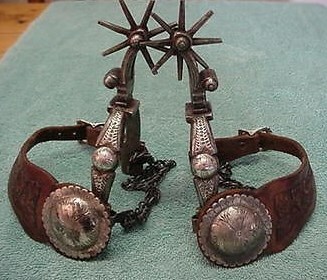 Bits and Spurs made during the Phillips & Gutierrez partnership can be found marked a couple ways the earliest mark is “P & G” inside the heelband of spurs or the cheek of bits, later they marked pieces “PHILLIPS & GUTIERREZ CHEY WYO”. Very few pieces are known from this partnership as it did not last long and no one knows how many bits and spurs were actually produced. Authentic pieces can be quite valuable on the collector’s market. Click here for information on Phillips and Gutierrez Maker’s Marks.